Furniture Connexions' spring savings event is now in full swing at its Briarhill, Galway, showrooms. There are fantastic savings in every department including sofas, dining, beds, and bedroom furniture for a limited time. 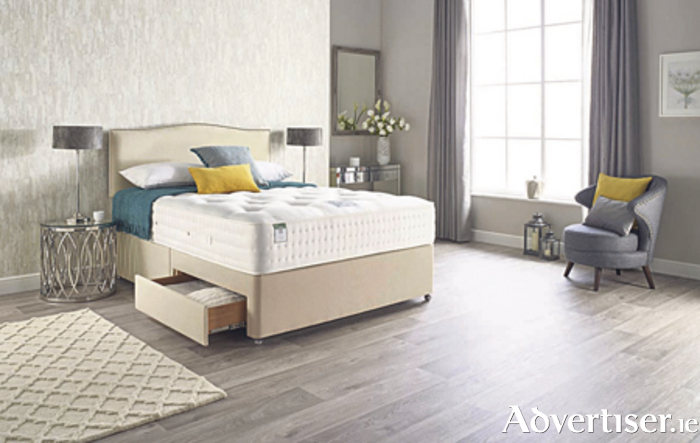 Well known Irish brands King Koil and Odearest are reduced with double discounts and free drawer upgrades on selected models as part of the spring savings promotion. Take time out to avail of the super spring savings while guaranteeing superior quality, comfort, and a great night’s sleep. The recently launched Myers beds 2017 collections are also on display with great reductions, and a free divan storage drawers promotion will certainly appeal to many customers. Customers interested in the bed tailor Natural Collection by Harrison beds can avail of a free size upgrade on selected models during the spring savings promotion. Furniture Connexions has a fabulous selection of fabric and leather sofas on display including individual chairs, sofas, corner groups, chaise elements — many with manual or electric recliner functions. All Furniture Connexions sofas are hand made to order, so you can choose exactly what you want in terms of model, pieces, covering, and matching scatter cushions. Why not give your room a new look and treat yourself to quality, comfort, and style with great savings on offer at Furniture Connexions. All leather sofas are custom made in Italy where again you can choose the combination, leather grade, and colour to suit your needs and budget. On display you will see features from Calia Italia, Polo Divani, and Italsofa — the comfort and style is second to none with pocket sprung seats as standard on some models. With more than 200 coverings to choose from, the selection of fabric sofas is particularly impressive — just bring along your room measurements and the sales team will go through the perfect combination for your room. The spring savings event at Furniture Connexions also brings some fantastic package deals on dining and bedroom roomsets where extra discounts are available when you buy a number of items in the same collection — see store for full details of these amazing offers. Furniture Connexions has an excellent offering of bedroom collections and wardrobes on display including hinged, sliding, and corner elements from both Irish and German manufacturers including Nolte Mobel. The great choice available gives a modern look and brilliant storage solution for every room in your home from main bedroom to children’s room or spare room. You will be amazed how much space you can free up using a properly designed solution and get rid of the clutter in your home. All this at a fraction of the normal built-in system cost. Another great bonus when dealing with Furniture Connexions is the free nationwide delivery service on all orders over €500. This is carried out by the company's own trained and experienced delivery teams, where they will deliver your furniture, put it in position, any small assembly required, and take away the packaging for recycling – all free of charge. The certified, trained, and experienced sales staff at Furniture Connexions will present you with the best options to suit your individual style and budget while offering top reliable brands that will serve you for many years to come. Furniture Connexions is open six days a week from 9.30am to 6pm and is conveniently located in Briarhill Business Park, Ballybrit. You can also keep up to date by liking the Furniture Connexions' Facebook page and be first to find out about the special offers in store. Furniture Connexions, Unit 23, Briarhill Business Park, Ballybrit, Galway. Phone 091 709550.